One of the most well-known of these is Dropbox, which has been rapidly rising in popularity over the last few years. 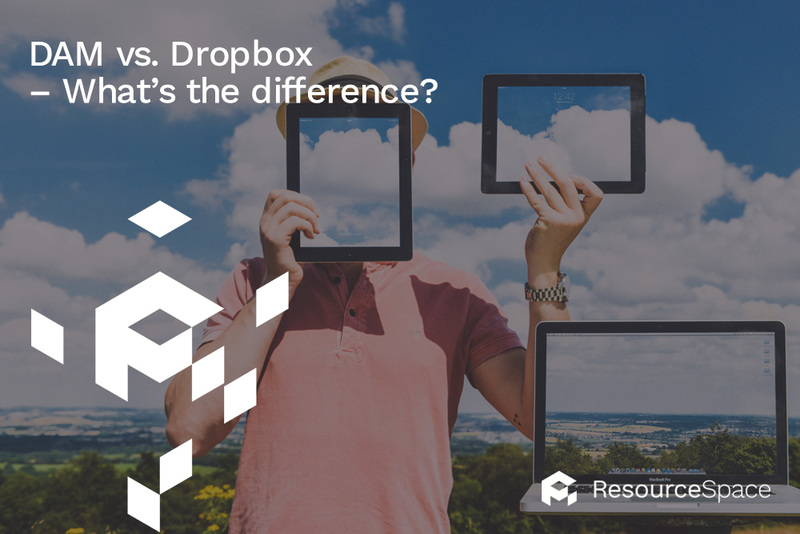 But how does Dropbox differ from traditional DAM systems? What are its features and limitations? And most importantly, which is the right option for you? Firstly, let's define exactly what Dropbox is: a cloud-based file sharing service. DAM stands for Digital Asset Management. The difference between the two is in their names. Whilst Dropbox is a file sharing service that has some limited options for managing assets, cloud based DAM has a much larger remit. DAM software is focused on everything to do with asset management; one part of that is cloud-based file storage, but there's a lot more too. Think of Dropbox like a digital version of the filing cabinet. Files and folders are all stored within it, and can be taken out or put in, and shared with other people. DAM is your whole office set-up and organisation - it includes those filing cabinets, alongside the team that labels, categorises and finds those files, and the employees who might use those files for various different purposes. The key part of any DAM or cloud file sharing service is the features they offer, and how that will affect your business. The difference between Dropbox and a DAM system is in the details of these features. In their simplest form, both Dropbox and a DAM system offer a place for you to digitally store files. However, Dropbox often limits the size and type of file you can upload. If you only use standard files like word documents, PDFs and JPEGs, then Dropbox will probably be just fine. But if you work with larger files and folders, including InDesign files, RAW images, comprehensive presentations and 3D files, then you'll likely need a system than can handle bigger file sizes in a wider variety of formats. The big difference between Dropbox and DAM software is if you need those files in a different format. With a simple file sharing service like Dropbox, all you can do is download those files as they are stored on the server. Any rendering or formatting will then have to be done yourself. But if you use an effective DAM system like ResourceSpace, you can instantly convert files to any size, quality or format you need. This transforming and transcoding is a key feature of DAM systems that you won't find with Dropbox, and it can make a huge difference to organisations who operate across multiple platforms. It takes the time and effort away from staff members, and certainly limits the demand on creative and design teams for small changes to files and formats. The ability to get files quickly in the format you need makes posting to social media and content management systems fast and simple. Although you can share files via email and social media on Dropbox, users will often have to log into Dropbox to download them. With a good DAM system, you can post assets straight to their final destination, with a whole host of third party integrations. You don't need to rely on other people having a Dropbox account or visiting the Dropbox website either when sharing documents or photos. A DAM system can easily create a secure third-party URL to share, which helps to maintain brand awareness too. (One of the great additional benefits of a DAM system is the option to customise and personalise the interface, as an extension of your organisation). With Dropbox, you might share individual files or folders with clients, but with a DAM system like ResourceSpace you can partition off whole sections, keeping multiple asset collections separate and giving groups of users privacy from others. Although both Dropbox and DAM systems have search functionality, the difference is in the complexity. With Dropbox, you can search for folder names, and file titles (if you know them). If you're looking for that specific product shot of the "black coat with three pockets and a hood", unless your assets follow a thoroughly organised naming convention, you might struggle to find it. More often than not, file titles are something like IMG1038.jpg. But DAM systems give you more power when it comes to searching, thanks to metadata. Users can input their own data onto every file, tagging all the keywords that are relevant, and the software can also extract metadata contained within documents and images. This means that searching for a "black coat with three pockets and hood" can return all the images that contain this product. You could also search by the type of asset and by date too, intelligently ordered by the highest quality files. DAM systems like ResourceSpace even allow you to search by geolocation, so you can find images taken by the studio in New York or Sydney, if you need them. One final key difference between Dropbox and DAM systems is the options you get around workflows, permissions and oversight. With Dropbox, you can share a file with another user with view-only permissions, or you can give them the option to edit and delete. DAM systems give you much more control over who has access to your assets - on a file and folder basis - and what they can do with them. Managers will be able to see exactly who is accessing which files and what amendments they have been making, with workflow actions that aid best business practice, promote collaboration and ensure oversight. Users can submit files for review, and supervisors can reject, archive, approve and publish. Perhaps most importantly, unlike Dropbox, DAM systems like ResourceSpace provide full versioning options. You will always be able to revert back after changes have been made - step by step or to older versions, ensuring nothing is ever lost by mistake. Batch revisions are also available for large collections of assets that may need to be rolled back. Basic tasks or full flexibility and control? Dropbox was originally created with a customer orientation, and later expanded to include business options. In contrast, DAM systems have always been focused on businesses and organisations. This is perhaps the core difference to focus on. So, whilst Dropbox, as it continues to develop, can increasingly do some of the small features that a DAM system can offer, it still has a very limited scope in comparison. On the other hand, DAM software can provide everything Dropbox does, as well as so much more. For simple cloud-based file sharing tasks, Dropbox is probably all you need. But if you need to share files securely, find assets quickly, organise them effectively, manage folders in several ways AND convert files to different formats - you're going to need DAM software like ResourceSpace. ResourceSpace can do all of the above, and has a lot more benefits that we haven't even mentioned yet. If you'd to like to learn more, sign up for your free trial with us or get in touch and we'd be happy to show you.